The strength of Dirty Modular lies in its wicked library of waveforms and general sound quality, which just about earn the ticket price. Great waveform library. Excellent sound. 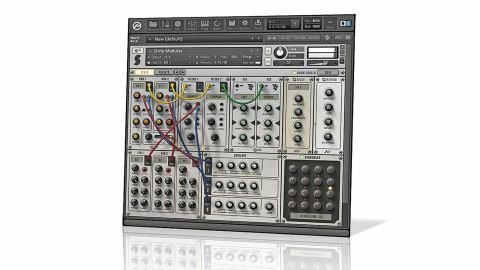 We're constantly amazed by the feats of instrument design that developers manage to pull off using interface scripting in Kontakt, but Dirty Modular raises the bar - in terms of ambition, at least. Built on 8496 samples captured from an analogue modular synth, it comes as a single NKI, with presets handled from directly within the interface rather than Kontakt's top-level browser. Nice. "Each of Dirty Modular's two oscillators has access to a selection of 170 multisampled waveforms"
Each of Dirty Modular's two oscillators has access to a selection of 170 multisampled waveforms, many of them pre-modulated and processed, serving as a very rich and varied pool of starting points. But it's the signal routing you really want to know about, right? Well, sadly those three LFOs and two ADSR envelopes are routed to their destinations via bog-standard menus, not by dragging those attractively rendered cables around - you didn't actually think Kontakt could do that, did you? Even more disappointingly, while the modular system works well enough, it's essentially a gimmick, with only a handful of destinations on tap (oscillator volume and pitch, filter cutoff and resonance, and LFO1/2 rate by LFO3), and audio routing amounting to nothing more than the overstated bypassing of filters and effects. Back on the upside, the LFOs themselves are actually pretty cool, featuring simultaneous mixable sine, triangle, square, rectangle and random waveforms for complex signal shaping. There's also a simple 16-step sequencer in place for onboard pattern design, two multieffect units (Chorus, Distortion, Phaser, etc), and dedicated delay/ reverb modules. Dirty Modular allows for a little more patching freedom than the average Kontakt-based synth emulation, but far less than most virtual analogue synths at the same price point.